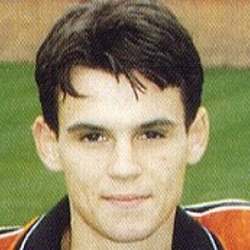 Grant was a regular in United reserves from August 1990 and played in the second string more often than in the first team over his seven years at Tannadice. After two seasons in the second eleven, he broke into the first team where he had frequent starts. Grant had his best season at United in 1995-96, helping to regain top flight status from the First Division. Out of contract at the end of 1996-97, he accepted a transfer to Huddersfield Town for a fee quoted at £100,000. He had been capped at Under-21 level for Scotland. Grant was born on this date in Dundee. The re-arranged match with Dunfermline at East End Park had arisen because Airdrie, our scheduled opponents, were on Scottish Cup duty. The game afforded midfielder Grant Johnson his first team debut as he came in for Ray McKinnon who was on the bench after nursing a slight calf strain during the week. Although this was the only change in personnel from the side which had defeated Falkirk, there was a tactical switch in defence where Maurice Malpas teamed up with Brian Welsh in central defence and Freddy van der Hoorn moved to left back. We created the early scoring opportunities with first Rhodes tipping over a Darren Jackson shot and shortly afterwards Dave Bowman had a close range effort blocked within the opening six minutes. However, it was Dunfermline, in the shape of Hamish French, who went closest to scoring in the first half. 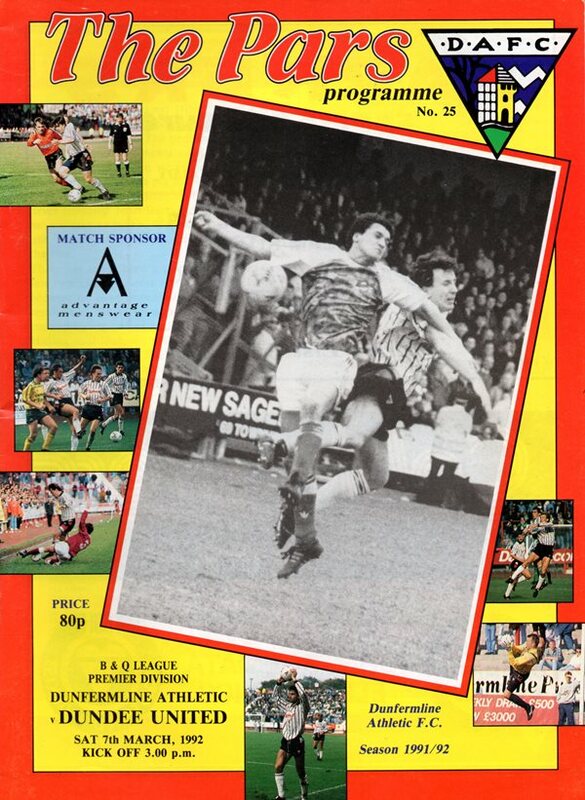 The former Tannadice striker saw Alan Main tip his shot on to the post and Shannon's follow up effort was blocked. Our best chance of that opening period came midway through the half when Duncan Ferguson flicked on a Brian Welsh cross to Victor Ferreyra who volleyed over right in front of goal only 8 yards out. For the second successive season our final match of the campaign was against Motherwell, but the circumstances were a far from the captivating Cup Final of the previous year. Fir Park's lowest crowd of the season saw the home side open brightly enough, but it wasn't long before we were threatening Thomson's charge. Two second half goals gave United a hard earned victory which took them back to the top of the First Division and relegated luckless Accies. Both Gary McSwegan and Brian Welsh returned to the side after missing the defeat against St Johnstone on the sandy wastes of Firhill. And the condition of the the pitch produced few threatening moments by the Tangerines against an Accies side fighting for their First Division lives. For only the second time since the start of the Premier Division, United emerged from the four games against Aberdeen without defeat.